Madison Charles, 6, models a jersey of Miami Dolphins' defensive back Sam Madison. The Miami Dolphins are her favorite team. 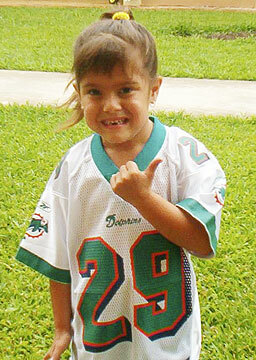 The 6-year-old in the oversized Miami Dolphins' jersey can't wait to go to Florida, home of her favorite football team. Madison Charles of Hauula will represent Hawaii in Champions Across America, a national Children's Miracle Network program. Madison weighed only 1.69 pounds when she was born at 26 weeks by Caesarian section. She will be one of 50 children who triumphed over severe injuries or medical problems serving as ambassadors for children's hospitals. They will visit Walt Disney World in Orlando and Washington, D.C., meeting celebrities and political leaders. Madison is excited about going to Florida because she knows that's where the Miami Dolphins are from, said her mother, Yavette Charles. Charles said her daughter loves to wear a No. 29 Miami Dolphins jersey with the name Madison for defensive back Sam Madison. Madison's mother, father Glenn, and 3-year-old sister Cassie, will accompany her on the trip, leaving March 14. They're all excited, Yavette Charles said. The children and their families will go to Walt Disney World for a Children's Miracle Network Celebration from March 16-18 and on March 19 they'll travel on a chartered Delta Airlines flight to Washington, D.C. to share their stories with congressional representatives. "These champions have overcome more than many of us can even imagine," Marie Osmond, Children's Miracle Network co-founder, said in a news release on the program. "Each story testifies of the strength of these kids and the outstanding caregivers who have changed their lives." Madison fought a long battle for survival after her premature birth on Feb. 21, 2000. She spent her first six months in the Neonatal Intensive Care Unit at Kapiolani Medical Center for Women & Children. Within the first 10 days, she had two surgeries for complications. She was on a ventilator for 3 1/2 months with a chronic lung disease. Her mother also was hospitalized for a week while doctors tried to stabilize her blood pressure. Madison Charles and her parents Yavette and Glen were attending the March of Dimes Hawaii Chapter's Prematurity Summit at Kapiolani Medical Center in February 2004. Madison fought a long battle for survival after her premature birth on Feb. 21, 2000. Madison was home for two months after her long hospitalization, then was taken back to the emergency room with setbacks and hospitalized again. Yavette was four months pregnant when she developed pre-eclampsia, a condition indicating the placenta may be detaching from the uterus. Symptoms include high blood pressure and protein in the urine. Madison now weighs 35 pounds and is 38 inches tall, which is in the 25th percentile for her age, her mother said. "Our 3-year-old daughter is one inch and one pound less than Madison." But Madison was on the soccer team last season, dances hula, rides her bike and plays with friends. "She is doing good," her mother said. "She will sit and watch Merry Monarch from beginning to end and not move from the TV -- even keiki hula. She gets mad when commercials come on," Yavette said. "She will not let us turn the channel." She and her little sister love to try and practice the hula dances they see on the television, her mother said. The only problem now is the child's sinuses and tubes in her ears are too small and she gets congested easily, Yavette added. Madison is in kindergarten at Laie Elementary School, which was planning to present her with a "Super Citizen Award" and a sendoff on Friday until the rainstorm hit the area. The Children's Miracle Network Celebration, airing June 2-4 nationally, will tell how the 50 "champions" overcame severe injuries and medical problems with specialized care from children's hospitals. Glenn Charles, in a Star-Bulletin interview in 2001, said he considers Madison "no less than a miracle. The technology, the doctors, nurses, everyone involved -- they worked hard."